Daesh returns to Palmyra. Photo copyright: Reuters. Gerda Henkel profiled the Heritage for Peace SHLTr project that they are generously funding, here. Although reports conflict, news agencies are indicating Daesh are once again in Palmyra and Tadmur, and that there is heavy fighting. See reports by the BBC here and here. See also information from the DGAM here. Al-Monitor gives a detailed profile of the military situation here, asking whether Russia will turn to Palmyra next? On 14 December 2016 Medmak shared a story stating that the DGAM “most of the artefacts in Palmyra have been shipped to Damascus”. See it here. 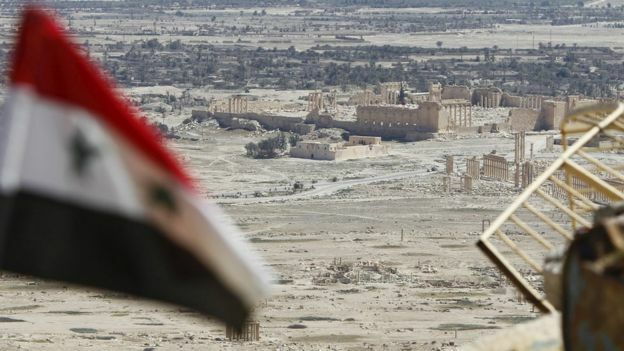 Franklin Lamb discusses here why he thinks Palmyra was lost, and whether it can be saved. Franklin Lamb reports on damage to the Aleppo Museum, and protection efforts of the staff, who are taking terrible risks. “Nearly all the long narrow windows that span the west side of the Museum were blown out over a year ago when mortars pierced the roof, one severely wounding a 4 year old girl who tragically lost her arm when a rebel mortar came through the ceiling of the Exhibition Hall she was sleeping in. At the time of the attack the child was sheltering in the Museum with her father who is a museum employee.” Read more here. On 15 December 2016 BBC Arabic published a video showing the main historic attractions in Aleppo and what happened since the conflict. See it here. On 14 December The Huffington Post published an article about the history of Aleppo and the recent events here. On 12 December 2016 Rescue the Old City of Aleppo released a video showing the damage in the old city, here. On 12 December 2016 Rescue the Old City of Aleppo released photos showing the stolen panels in Wooden Room at Saif Aldalwla here. Photos of damage to the school of Seif al-Dawla, Khanqah Farafra, Alsuekah within old Aleppo, shared by the DGAM here, and to the wooden room in Saif Al-Aldawla, Aleppo, (the old city directorate offices), available here. The DGAM have released a drone video that highlights damage to the Aleppo Citadel, here, supported by a number of photos on their website here . Aleppo Archaeology have uploaded a video of damage to the Great Aleppo Mosque here.There are also a number of photos of the damage on their website here, and here .These are supported by a number of photos from the DGAM here. The DGAM have reported on damage to the markets and khans in Aleppo here and here. The fire took place at Mardam Biek suq (Al Tahan Avenue) at the western edge of the trade centre Al-Hamidiyah in the old city of the Damascus. The DGAM have issued reports on the fire here and here. ASOR Cultural Heritage Initiatives Weekly Report 119–120 (November 16, 2016 – November 30, 2016) has been published. Newly published video footage shows evidence of militarization and intentional destruction at Mar Gewargis Church in Bartella, Ninawa Governorate (ASOR CHI Incident Report IHI 16-0035 UPDATE). New video footage and photographic evidence show tunneling at Mart Barbara Church in Karamlish, Ninawa Governorate (ASOR CHI Incident Report IHI 16-0038 UPDATE). New video and photographs shows additional evidence of intentional destruction to religious sites in Bakhdida, Ninawa Governorate (ASOR CHI Incident Report IHI 16-0043 UPDATE). New video footage and photographs show damage to sites in Bashiqa and Bahzani, Ninawa Governorate (ASOR CHI Incident Report IHI 16-0046). New video footage and photographs have been published of Mar Behnam Monastery following the recapturing of the area by Iraqi forces in Mosul, Ninawa Governorate (ASOR CHI Incident Report IHI 16-0047). An airstrike damaged a mosque in Tayyibat al-Imam, Hama Governorate (ASOR CHI Incident Report SHI 16-0169). Alleged SARG airstrikes damaged two mosques near Damascus, Damascus Governorate (ASOR CHI Incident Report SHI 16-0170). Alleged SARG and Russian airstrikes damaged four mosques in Aleppo, Aleppo Governorate (ASOR CHI Incident Report SHI 16-0171). An alleged Russian airstrike severely damaged a mosque in Anadan, Aleppo Governorate (ASOR CHI Incident Report SHI 16-0172). An alleged SARG airstrike damaged a mosque in Binnish, Idlib Governorate (ASOR CHI Incident Report SHI 16-0173). The Day After Heritage Protection Initiative offer insight into the looting ongoing in Syria, before and during the conflict, in Syria Direct here. Palmyrene, Libyan & Yemeni artifacts seized at Swiss free port after being trafficked via Qatar. See more information in France 24 here. Idlib Antiquities Centre released a documentary video by Al-Jazeera about the Hekaya educational project, which aims to raise awareness about the importance of protecting the cultural heritage among the children of Idlib. See more here. Under the patronage of Ministry of Culture, in collaboration with Ministry of Tourism, Directorate General of Antiquities and Museums, and the Office “ ICONEM “ for document the heritage, held a scientific Colloquium titled “new visions and proposals for the resilience of the Syrian heritage” on December 10 to 11, 2016 at the National Museum in Damascus, reported on the DGAM website here. Participants called for the creation of a Web database to publish Syrian archaeological documents, and carrying out rescue work for heritage in coordination with concerned Syrian institutes, reported here in the Syria Times. Entitled “Six Years”, Nizar Sabour’s art exhibition was opened at Khan As’ad Basha. The exhibition showcases more than 120 artworks of different themes, stemming from the heart of the Syrian pain and suffering. It narrates stories of resistance and steadfastness. In a statement to SANA, Sabour said that the exhibition includes all art works of his own since 2010 up to the present date, adding that the first two paintings rose a question about if the intuition could tell anything about the future after which he worked on art as a witness of society and a way to defend life against death. Read more in SANA here. The two-day Conference brought together heads of state and ministers from over 40 countries affected by heritage loss due to armed conflicts, alongside key players involved in the field of heritage preservation, international public and private institutions, museums and private donors engaged in the field of cultural heritage, as well as experts working in the field. The conference set up an international fund and demanded the UN Security Council intervention to protect cultural heritage during armed conflicts. The international fund will be based in Geneva in Switzerland, according to Jack Lang, the French President’s representative to the conference. France will contribute $30 million (£24M) in the next two years towards the fund; the UAE also announced its commitment at the conference. the rest will be obtained by fundraising. France and the UAE are also discussing the possibility of introducing a resolution at the UN Security Council for the protection of heritage sites in conflict zones, based on the proposals and recommendations to be made by the conference, Lang said. The News Section (below) contains links to a number of news articles covering the conference, and there are a number of photos of the conference on the Association for the Protection of Syrian Archaeology Facebook page here. “The U. S. Department of Justice announced today that the United States has filed a civil complaint seeking the forfeiture of multiple antiquities associated with the Islamic State of Iraq and the Levant (ISIL), also known as Da’esh. The complaint alleges that ISIL, which is designated by the U.S. Department of State as a Foreign Terrorist Organization, markets and sells antiquities to finance its terror operations. The lawsuit marks the first time that the United States has filed an action to forfeit antiquities that are foreign assets of ISIL.” Read more here. The Aleppo Project has published a report on how conflict has transformed the Syrian economy. Three groups shape the Syrian war economy today: a violent, power-seeking elite that now controls most sources of wealth; a new opportunistic class providing services to a third group; that is the urban poor living on the edge of survival. This report studies the state of the war economy in rebel held Aleppo and Idlib provinces. How important is the Syrian-Turkish border for the economy? How do rebels finance their war? What are the characteristics of the shadow economy? How does the poor majority cope with the new reality? The second section focuses on ISIS oil trade where rebels, smugglers, shopkeepers, factories, criminal networks and ordinary people have been sucked into. Why it is difficult to destroy ISIS oil economy? What is the alternative? For a copy, please contact the author, Marta Miras or H4P. Read Lessons from the Rubble of Palmyra, in the Atlantic, here. Apollo: The International Art Magazine examines Palmyra’s legacy, here. Al-Monitor profiles the Syria, A Living History Agha Khan Exhibition in Toronto, here . The exhibition is also covered here in QZ. Why extremists destroy ancient treasures, from USA today, available here. E-Flux considers the Destruction of cultural heritage, from Napoleon to ISIS, here. ~An Article on Press Reader here. Fisk highlights the complexities of the discussion about returning artefacts taken (legitimately or otherwise) during the colonial era in the Independent here. Berita Daily reports on Cultural heritage in jihadist crosshairs here.